All volatility Exchange Traded Products (ETPs) use indexes that track a mix of two or more months of the CBOE’s VIX Futures. Calculating this mix is not trivial and has resulted in a lot of bleary eyes—including my own. 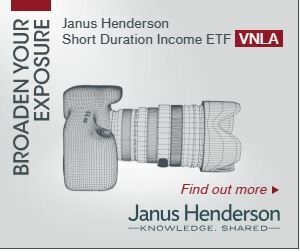 My intent with this post is to help you understand, and if you desire to accurately compute the key indexes used in VXXB and other short term volatility funds using Excel or similar tools. Why do we need a roll anyway? If we could directly buy the CBOE’s VIX® index none of this would be necessary. Unfortunately, no one has figured out a cost-effective approach so we are forced to use the next best thing—VIX Futures. Like options, VIX futures have fixed expiration dates so volatility indexes need a process of rotating their inventory of futures in order to have consistent exposure to volatility. 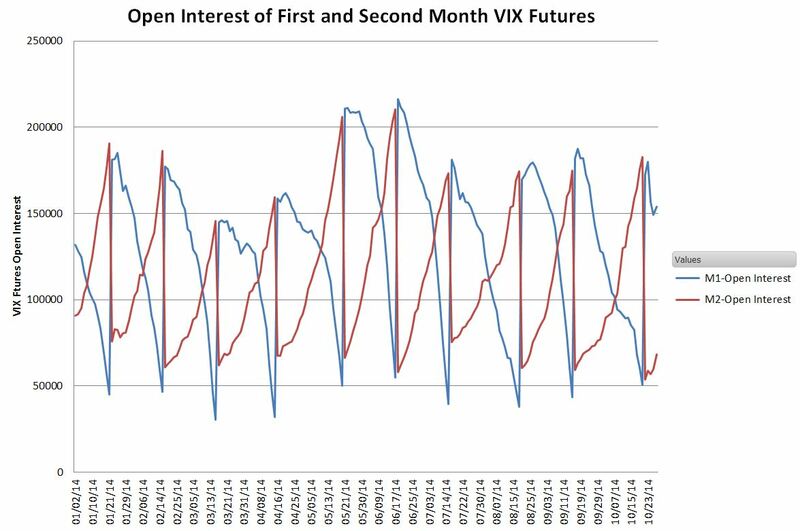 This rotation process is evident in the open interest chart below—the next to expire futures being closed out and the next month of futures being opened. Before we dive into the details of how this rotation is dealt with, I’d like to address one source of confusion. ETP’s are not obligated to follow the approach detailed in the indexes. They are allowed to use other approaches (e.g., over-the-counter swaps) in their efforts to track their indexes. When ETPs are working properly, their prices closely track the index they specify in their prospectus minus their fees that are deducted on a daily basis. Because indexes are theoretical constructs they can ignore some practical realities. For example, they implicitly assume fractional VIX futures contracts exist and that the next day’s position can be put in place at market close—even though calculating that position requires market close information. I’m sure these issues cause headaches for the fund managers, but to their credit, the funds usually closely track their index. The details for the index (ticker SPVXSTR) that VXXB tracks are detailed in VXXB’s prospectus, pages PS-21 through PS-22. The math is general enough that it covers both the short term index that VXXB uses and the midterm index VXZB uses—which adds to its complexity. The equations use Sigma notation, which probably makes it challenging for people that haven’t studied college-level mathematics. I will present the math below using high school level algebra. Except for interest calculations, all references to days are trading days, excluding market holidays and weekends. The volatility indexes used by short term volatility ETPs (list of all USA volatility ETPs) utilize the same roll algorithm—at the end of each trading day they systematically reduce the portion of the overall portfolio allocated to the nearest to expiration contracts (which I call M1) and increase the number of the next month’s contracts (M2). The mix percentages are set by the number of trading days remaining on the M1 contract and the total number of days the current M1 will be the next to expire contract (varies between 16 and 25 days). So if there are 10 days before expiration of the M1 contract out of a total of 21 the mix ratio for M1 will be 10/21 and 11/21 for M2. At close the Tuesday before the Wednesday morning M1 expiration there’s no mix because 100% of the portfolio is invested in M2 contracts. It’s important to understand that the mix is managed as a portfolio dollar value, not by the number of futures contracts. For example, assume the value at market close of a VIX futures portfolio was $2,020,000, and it was composed of 75 M1 contracts valued at 12 and 80 M2 contracts at 14 (VIX futures contracts have a notional value of $1K times the trading value). To shift that portfolio to a 9/21 mix for M1 and 12/21 for M2 you should take the entire value of the portfolio and multiply it by 9/21 to get the new dollar allocation for M1, $865,714 (72.14 contracts) and 12/21 times the entire portfolio value to get the dollar allocation for M2, $1,154,286 (82.45 contracts). Value weighting gives the index a consistent volatility horizon (e.g., 30 calendar days)—otherwise higher valued futures would be disproportionately weighted. The next section is for people that want to compute the index themselves. Yes, there are people that do that. If you are interested in the supposed “buy high, sell low” theory of roll loss you should check out the “Contango Losses” topic at the bottom of this post. Lowercase “t” stands for the current trading day, “t-1” stands for the previous trading day. The index level for today ( IndexTRt ) is equal to yesterday’s index (IndexTRt-1) multiplied by a one plus a complex ratio plus the Treasury Bill Return TBRt. The index creators arbitrarily set the starting value of the index to be 100,000 on December 20th, 2005. The number of trading days remaining on the M1 contract is designated by “dr”. The “dt” is the total number of trading days that the M1 contracts are the next to expire futures contract. M1 and M2 are the daily mark-to-market settlement values, not the close values of the VIX futures. 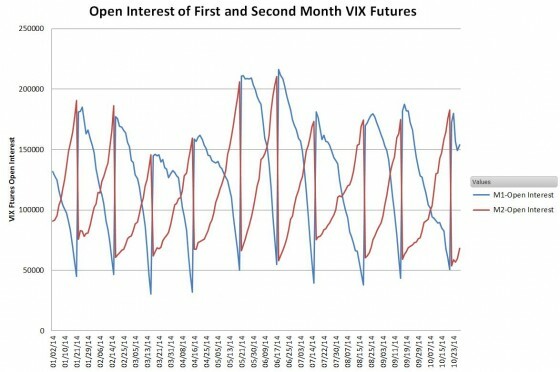 The CBOE provides historical data on VIX futures back to 2013 here. The equation assumes that the entire index value is invested in treasury bills. This special case illustrates that there is no erosion of the index value just because it’s selling lower price futures and buying higher-priced futures—in fact, it goes up because of T-bill interest. It’s the equivalent of exchanging two nickels for a dime—no money is lost. For more on this see: The Cost of Contango.